On Monday, PokerStarsattracted a record 253,698 players to an online poker tournament, setting the record for the largest online poker tournament ever held, according to a press release. The same release detailed, “It beat the previous record of 225,000 players that was set on June 16, 2013 during the PokerStars 100 Billion Hands Celebration campaign and shows that poker is still growing in popularity around the world.” The winning hand is pictured here. The tournament was a $0.01 buy-in event called the Common Cents Kickoff, the start of a week-long mico-stakes series on PokerStars. It had a guarantee of $100,000, so there was $97,000+ in overlay. The Kickoff’s winner was PocketFiver DaDumon from Austria, who pocketed $10,000. And the tournament, which was a turbo, didn’t last nearly as long as you might think, as it was over after six-and-a-half hours. 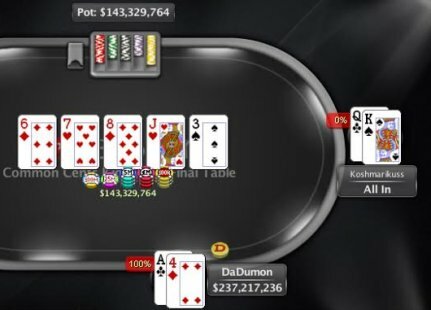 World records have been broken multiple times on PokerStars in the past, so the latest feat certainly isn’t anything new for the poker site. For example, in 2009, PokerStars tried to break the standing record of 65,000 entrants by hosting a $1 tournament that had a $300,000 guarantee. Earlier that year during the WCOOP, it set the record for the most number of players seated at online poker tables simultaneously at 307,000. In 2012, PokerStars pro Randy Lew, aka nanonoko, played 23,493 hands over the course of a standard workday, a new record. He averaged 2,936 hands per hour during the eight-hour stint, or 49 hands per minute. The win on Monday pushed DaDumon to $700,000 in tracked online tournament winnings. His largest score ever came last year after a fourth place finish in the Sunday Million for $76,000. He is the 31st ranked player in Austria and #2,319 worldwide. He was ranked as high as #470 on PocketFives in 2012. Visit PokerStars for more details. I registered for that tournament a week ago and completely forgot about it, sat out the whole thing. At least it was only a penny. Am i missing something? How did they break a record if they had a $1 300k gtd already? Zem, maybe there was an overlay. However my problem is 253,000 players at .01 entry fee generates a prizepool of $2530.00. How the hell did he win 10k? EDIT: OK maybe mention the 100k guarantee next time! CRAZY overlay unless they were expecting 10 million players! quick but I think I got my edit in first lol. Ha. $97,000+ in overlay in this puppy. Not bad.